CodeBreakers® is a systematic synthetic phonics, multi-sensory, structured, cumulative literacy programme. CodeBreakers® is for students with dyslexia and those who want to improve literacy skills. The programme is aimed at students of all ages and abilities from 5 yrs to post 16. CodeBreakers® maintains the interest of primary school students as the ‘tutor’ can include learning through play. CodeBreakers® is also used with school leavers in FE and apprenticeships. It is also successful with adults wanting to return to study. CodeBreakers® has been designed to enable tutors, T.A.s or parents, carers or partners to deliver it. It is highly structured and provides all worksheets, answers and flashcards. The Instructor’s Manual is also provided so that the ‘tutor’ is aware of how to best complete the worksheet or game, which principles it develops and how to make the most of the multi-sensory experience, to ensure that information is stored and retrieved in a structured way, to develop independent learners. How much time per week do we need to spend practising CodeBreakers® at school? Work with CodeBreakers® as little or often as you wish. You can repeat games on a daily basis if you wish to reinforce learning. Overall we would recommend 90 mins on average to complete a workbook but we would strongly recommend that this is not completed in one day. Students need time to absorb information. Think quality not quantity. Practice 2-3 times a week for 20-30 mins, CodeBreakers® is great for 1:1 or group intervention programmes. CodeBreakers® is all about taking things at the student pace. Over learning is the key to learning and retaining information. Will my student engage with CodeBreakers® programme? Students have used this programme for 1:1 tuition and repeatedly attended lessons and had fun! There are lots of games to engage younger students. The programme can be adapted for older students, with less emphasis on play, although even our older students love a game of bingo! As there are no pictures, this removes the stigma of ‘additional support’ which stops some older students engaging in some programmes. Students who use CodeBreakers® can quickly identify their own learning and success. They enjoy learning, receive immediate feedback and can be found to intrinsically motivate themselves. Students become self assured how to complete workbooks and quickly become independent learners. CodeBreakers® has been used in EBD settings and reported as ‘keeping students engaged for longer’. Each workbook is structured and cumulative which means that students are only asked to read and spell sounds they have discovered at previous levels. Therefore they have a positive experience completing each workbook. Our school isn’t in mainstream, is CodeBreakers® suitable? CodeBreakers® has been used with children of all ages who have Global Development Delay, Autism, Dyspraxia, ADHD, Pathological Demand Avoidance (PDA), receptive language difficulties, audio and visual processing difficulties. The great thing is CodeBreakers® works at their pace and gives lots of opportunity for over learning. My student has visual processing difficulties, does CodeBreakers® help? CodeBreakers® is written in a dyslexia friendly font and can be printed on a specific colour paper to help reduce visual stress and inaccuracy when reading. My student has difficulty with phonics and struggles to learn phonics, does CodeBreakers® help? My student has not had a positive experience of learning to read and spell and finds it difficult to engage in learning, does the programme help? CodeBreakers® builds student confidence and keeps students of all ages engaged. CodeBreakers® has bite-sized work sheets and tasks are quickly completed with immediate feedback. The consistent lay out of the workbooks means your student will begin to anticipate how to complete the workbooks, as they are solely working on one sound/pattern they can begin to build their skills using the pattern/sound and have a positive experience. My students struggles to read whole words, will CodeBreakers® help? Students who have followed CodeBreakers® don’t simply learn whole word recognition of high frequency words, they develop knowledge of words through the pattern, etymology and morphology, students are able to analyse sounds and the patterns of letters which make sounds, to apply logic and transfer this knowledge to other, less familiar words. This enables students to access a wider wordbank by transferring knowledge. My student struggles each week to recall words in spelling tests, how will CodeBreakers® work? Traditionally students are asked to learn 10 spellings per week from the National Curriculum. It makes it simpler if they can be grouped into words which have the same pattern to reduce the amount of patterns they need to recall. Usually these are taught by “Look, say, cover” methods. Students are essentially recalling what the whole word looks like rather than understanding each ‘component part’ of a word and how a word is made up of sounds, syllables and possibly suffixes. Students using CodeBreakers® will learn how to encode words, sound out words and make a written response for each sound. Unless you want to use your own games to add to the play tasks, resources are included. The pack includes printable flashcards and games. You will need a set of wooden letters to build words, a dice for games, coloured pens and paper and card for printing workbooks and games. CodeBreakers® is available as a School Edition, you may also like to tell parents about the Home Edition. Why should schools buy CodeBreakers®? The structured workbooks quickly build confidence as students become assured, knowing how to complete workbooks and quickly are able to become independent learners. Students are able to successfully complete workbooks with instant positive feedback provided both intrinsically and extrinsically. CodeBreakers® has been designed to allow staff at all levels to deliver the programme without specific dyslexia training. How can I monitor progress? You will also receive baseline tests with parallel testing forms for reading and spelling, which do not require any preliminary qualifications to use. The parallel forms are quick to complete and can be used at 6 month intervals. You can use CodeBreakers® for both 1:1 and group work if students are working on the same workbook. The games are great played as a group and extra sheets can be printed where required if there are more than two players. Not all staff delivering support are dyslexia trained, can they use CodeBreakers®? The workbooks and Instructor’s Manual provide all the information on how to successfully deliver CodeBreakers® programme and therefore requires very little staff training. The additional Lesson Plan can also provide prompts for ‘tutors’ and a structured method to record each task. All the preparation has been completed, so there is no need to find resources from various programmes and prepare a lesson. Each work book will offer regular worksheets, which enables staff to gain confidence in how to deliver the programme and students are encouraged by their success, due to the familiarity of the work. If your school or training provision is looking for a synthetic phonics programme, which is multi-sensory, cumulative and structured, CodeBreakers® programme is for you! Still not sure if CodeBreakers® is for your school? 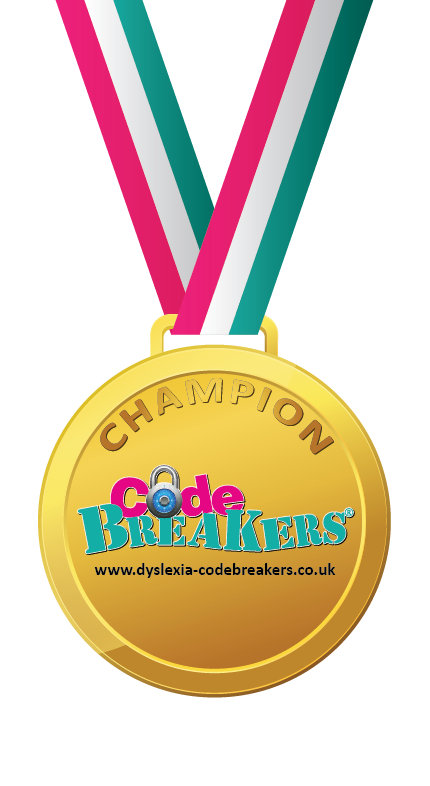 Would you like to receive a discount by being a CodeBreakers® Champion? Contact us to learn how to receive a discount for your school. As CodeBreakers® can be used as an intervention programme to raise literacy attainment levels of learners with many learning difficulties and to boost literacy for all students, it’s an excellent choice for Pupil Premium. Schools will be able to evidence and track progress through the programme for every student enrolled on CodeBreakers®. The parallel baseline tests will also allow progress to be measured. Overall CodeBreakers® will develop confident and independent learners, an enjoyment of learning and improved literacy skills.